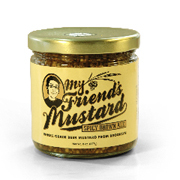 WHAT’S IT TAKE TO TRY TO MAKE IT AS A SMALL FOOD MANUFACTURER in New York City? That was the theme of a panel discussion last Tuesday at Leonard Lopate’s popular annual event series about the New York food scene. 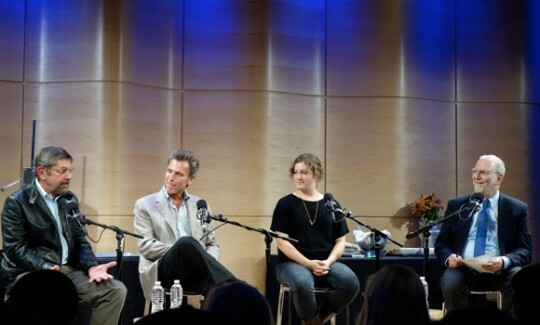 Three entrepreneurs came together with the broadcaster at WNYC’s Greene Space in Manhattan: Steve Hindy, cofounder of Brooklyn Brewery, Mark Rosen, a family member from the second of three generations making Sabrett hot dogs, and Anna Wolf, founder/owner of My Friend’s Mustard. Lopate and Locavores: Discussing the ups and downs of running a food or drink business in NYC, with (from left) Steve Hindy of Brooklyn Brewery, Mark Rosen of Sabrett hot dogs and Anna Wolf of My Friend’s Mustard. 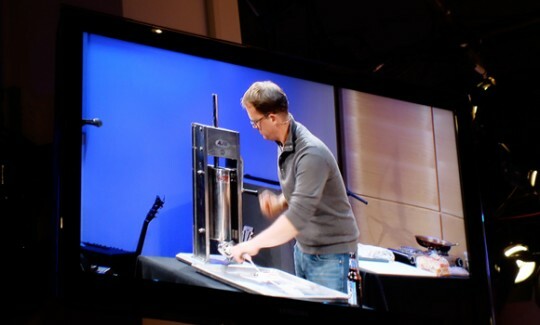 Later in the evening, Scott Bridi of Brooklyn Cured gave a lesson in sausage making, and Siggi Hilmarsson demo’d how to make Siggi’s Icelandic strained yogurt. Mark Rosen is part of a family business started in 1926. 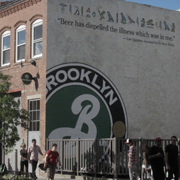 Founder Gregory Papalexis, Rosen’s father-in-law, was the son of a baker who also had a hot dog business. 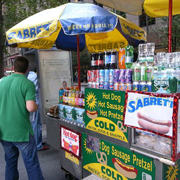 Sabrett now manufactures 45 million pounds of frankfurters a year out of two plants in the Bronx, selling them up and down the east coast and wherever “New Yorkers are hiding out throughout the country,” said Rosen, but most visibly from pushcarts with the iconic blue and yellow umbrella all over New York City.